The Archers Archives celebrates 60 years of the nation's favourite radio drama - looking back at the most dramatic events to happen over 16,000 episodes, complete with cast and crew interviews. 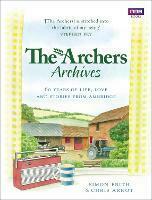 Relive the defining moments in Archers history, from the devastating 1955 stables fire and the 1957 Tom Forrest manslaughter charge to the shocking imprisonment of Susan Carter in the early 1990s, the revelation of Brian Aldridge's affair with Siobhan Hathaway, and the Grundys' eviction from Grange Farm and exile to Meadow Rise. Script-writer Simon Frith and journalist Chris Arnot take you inside the creative life of the show, sharing how the series' storylines are planned and produced, and how the historical and cultural background of each period is interwoven into the everyday lives of the residents of Ambridge. Complete with original photos, some never-before-seen, The Archers Archives is an indispensable addition to every Archers fan's collection.